One of the more interesting “ingredients” in Thai cooking is a special incense candle, (tien ohb, in Thai). This candle is commonly used in the making of sweetmeats and desserts to add a spicy fragrance and smokiness by “smoking” ingredients, such as shredded coconut. 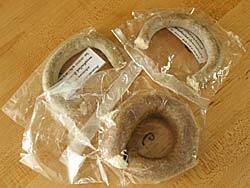 The incense candle is made of organic matter including herbs and flower petals. 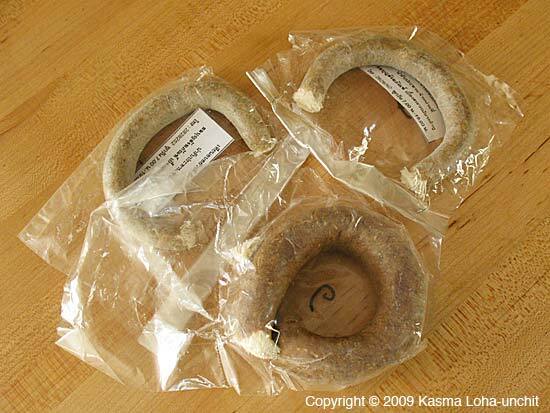 Brown in color, it has a curved shape and can be lit on both ends. This exotic item as this may not be easy to find in Western countries; ask for it in specialty Thai markets in cities with sizable Thai populations. If you travel to Thailand, look in stores that carry incense and merit-making supplies. I usually buy mine from one of the stores carrying them in Banglampoo, in Bangkok. There are several different kinds from which to choose. Sniff and discover which fragrance you like. One candle will last a long time; it will burn very slowly and produce a lot of scented smoke. 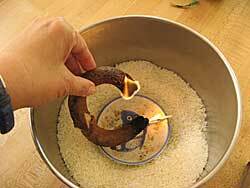 To smoke with an incense candle, put the uncooked coconut mixture loosely in a bowl and place the bowl inside a large pot. 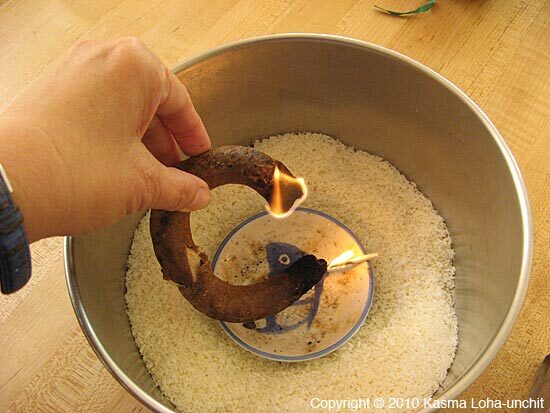 Light the candle on both ends and position alongside the bowl. Close the lid tightly, adding extra weight over the top if necessary—such as an inverted stone mortar—to prevent smoke from escaping. Allow to smoke 30 minutes to one hour. For a stronger smoky flavor, relight the candle after 30 minutes to produce more smoke. 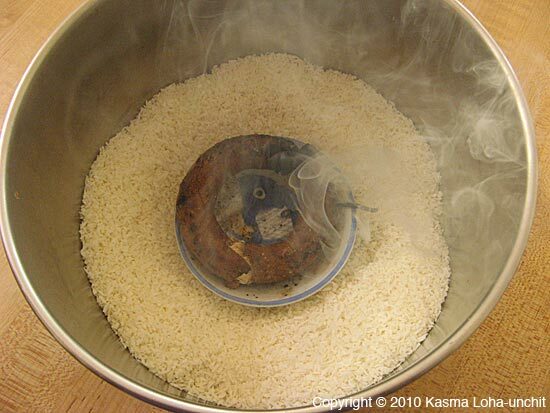 One of Kasma’s recipes that uses an incense candle is: Grilled Coconut Cakes – Kanom Paeng Jee. Written by Kasma Loha-unchit, August 2010. This entry was posted on Saturday, September 4th, 2010 at 12:05 am	and is filed under Cooking, ingredient. You can follow any responses to this entry through the RSS 2.0 feed. You can leave a response, or trackback from your own site. i’m ploy my mum want to know were can she get the incense candle in the uk. http://www.raanthai.co.uk/retail/Kitchen_Essentials.html – it’s found near the bottom of the page.